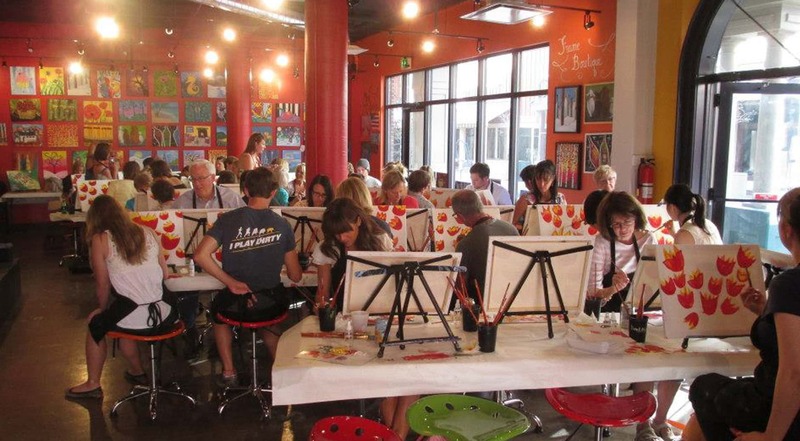 The Paint Mixer offers Day and Evening Classes and Open Studio. The studio is also available for private parties, for birthday parties, bridal showers, and bachelorette, holiday parties; for corporate and team building events, and fundraisers. Online registration is encouraged; walk-ins are welcome based on available space. Painting skills and artistic talents develop naturally as the instructor takes everyone through the step-by-step process of recreating the featured painting. The personal piece of art creates a long lasting memory or makes a great, personalized gift. Custom frames are available for sale for on-site framing for all artwork so that your new masterpiece is ready to be hung immediately. Prices for Friday and Saturday 21+ Classes are $45, most other classes are $35, and kids under 12 years paint for $30. Price includes instruction and all materials: canvas, paint, brushes, easel, and apron. OPEN STUDIO allows individual to make use of the studio, a canvas and art supplies for a $30 fee for a 2-hour session. The Paint Mixer To-Go brings the event, instruction and materials to the location of your choice. 1. Go to the calendar and choose a featured painting and date. 2. Book your spot(s) online or by phone. 3. Bring your friends or schedule a party. Get ready to paint! We'll provide everything you need, including wine, beer and non-alcoholic beverages and snacks to help you unleash your inner artist.